I had a light bar on my Saabaru and loved it for my rural winter commutes in the dark.. It worked wonders for seeing and avoiding deer, right up until the day the fuse blew and I hit a deer at 55mph. After getting a new car (the XT) I promptly ordered the same setup, a set of Hella 500 driving lights and a set of fogs. Life happened, however, and the lights never left the box. Fast forward 2 years, and my XT is fresh off a new exhaust and stage 2 tune. STI uppipe, CNT catted down and a 3" catback has given me about 50hp and 60ft/lbs over stock, and the car feels great. I’ve got a fresh set of winter rubber on order for my Sparco Terras to hopefully help keep myself from stuffing the thing into a tree on the first day of winter weather. 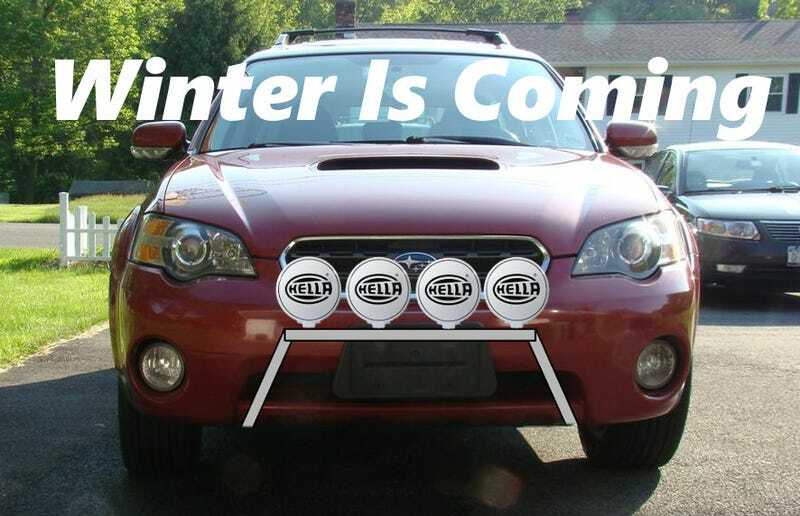 Only one thing is left to complete the transition into winter mode: the return of the light bar. The bar I made for my Saabaru worked in the sense that it held the lights up and didn’t wobble too bad, although it was a pain to take on and off and I think it ultimately transferred a lot of the deer strike energy directly into the radiator mounts. I was honestly somewhat glad to get rid of that car due to a number of nagging issues, but I’d like to give my XT a fighting chance should something happen. I’m definitely not expecting an aluminum bar to do anything against a deer at speed, but if I can keep it from doing more damage to the car than a strike with no light bar I think I’ll have done good. Hopefully things don’t come to that! Thankfully my XT has a few bolts for mounting the factory “skid plate” type thing that keeps snow from getting jammed under there. Using those and the two license plate screws should give me a fairly solid mount to hold 4 lights... I hope. Taking the lessons from my last bar, I’m using wider aluminum angle iron for almost the whole thing. This should give me enough space to get a socket around the nuts to mount the lights, something I couldn’t do last time. I’m mounting the lights lower down, as last time the rims of the driving lights could be seen glowing just over the top of the hood in a distracting manner. I’m going to build a harness with quick disconnects for easy removal, and I’m going to wire the driving lights to turn off with the high beams. The only thing I’m not sure about is the effect of the 4 hot lights in front of the grille. I never had any issues with this before, but now with the turbo car sucking more air (albeit through the stock intake) I’m wondering if there will be a negative effect. The lights only cover about the bottom half of the grille, but I’m thinking the airflow over the lights might push the air onto the hood rather than into the grille? On the other hand, the lower grille opening is pretty big, and I’m primarily expecting to run the lights in the winter when the air is cold. Maybe I’m overthinking this? The alternative would be to lower the whole bar down about 4 inches. The issue with that is being in NY with our draconian plate laws I need a front plate. Mounting that lower then blocks a large portion of the lower grille and gives the car even more of a fatty bucktooth beaver face. No Bueno! Finally, I need to figure out how to build the whole thing out of one piece of 1.5" x 1.5" aluminum angle in the strongest way possible. Planning on notching one plane of the angle so I can bend the other plane, and then possibly using epoxy and/or plates and bolts to hold the cut parts together. I wish I could weld Aluminum, but for now at least that’s not possible. Any better ideas? Anything I’ve overlooked? Any tips for painting aluminum in the possibly 40 degree weather coming up? I’ll be doing the build this Thanksgiving weekend as well as mounting the snows, so by Monday I should be ready for winter. Bring it on!